The Duke of Edinburgh has been taken to hospital as a "precautionary measure" for treatment of an infection. 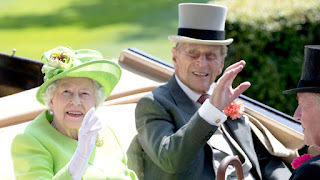 Prince Philip, who has had some medical problems over the years, was driven by car from Windsor Castle to a London hospital at around 7pm on Tuesday on the advice of doctors. No other details were disclosed by Buckingham Palace, and it is not known how long he will be kept under the watchful eye of medics. He appeared to be in good health at the opening day of Royal Ascot with the Queen earlier in the day, and well enough to go about his usual business. The pair were joined at the sporting and social occasion by other senior members of the Royal family including, the Duke and Duchess of Cambridge, the Prince of Wales and Duchess of Cornwall. Prince Philip was supposed to be returning there later - and also accompanying the Queen to the State Opening of Parliament - but his place was taken by Prince Charles instead. A Buckingham Palace spokesman said: "The Duke of Edinburgh was admitted to King Edward VII Hospital in London last night, as a precautionary measure, for treatment of an infection arising from a pre-existing condition. He said the Duke was "in good spirits" but "disappointed" to be missing both events. "Her Majesty is being kept informed and will attend Royal Ascot as planned." It is not the first time the Duke has missed an official engagement.